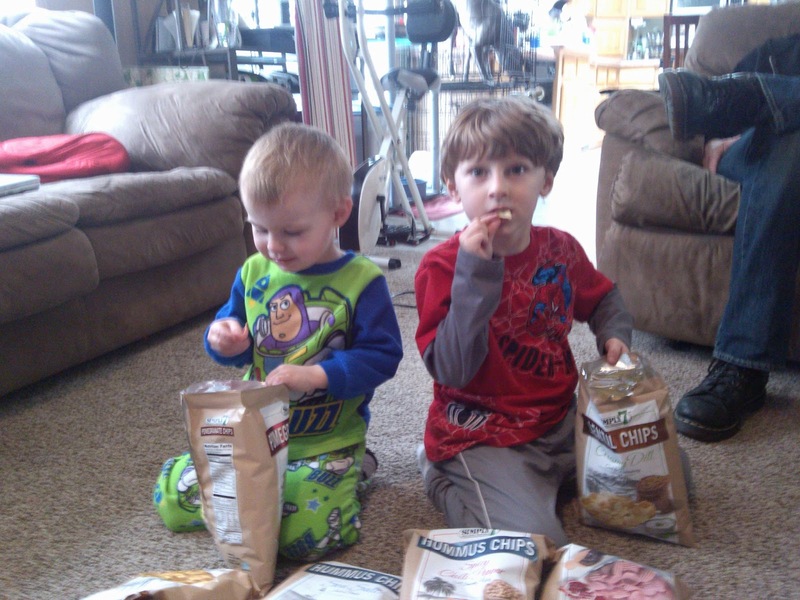 Somehow we decide as children that we just don't like some foods for no reason in particular. My son tells me all the time when I ask him to eat certain foods, "Mommy I don't like that. I don't need to try it, I know I just don't like it." We've all been this way at one point and time in our lives. I think as children we don't want to eat those things we are told are healthy. Even as an adult these foods sometimes don't appeal to the senses especially visually. I have been lucky enough to work in restaurants for most of my adult life which has opened me up to a whole new world of foods and cooking. I was raised mostly on fast foods and delivery, which I think is why I think it why I struggle with my weight so much. 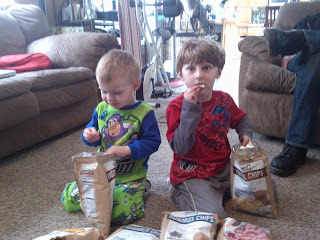 Recently, I was asked by Simply 7 Snacks to review several of their Health Food Snacks. I was very thrilled to get this opportunity since the last few times we sampled a natural food, the kids surprisingly loved them! Simply7 was created with 7 goals in mind - 0 Grams Trans Fat and No Cholesterol, No Artificial Colors or Flavors, No Additives or Preservatives, Gluten Free Ingredients, All Natural Recipes, and of course Simple Ingredients and Simply Delicious. "You should be able to identify the raw vegetable, fruit, grain, or legume the ingredients in our products come from." 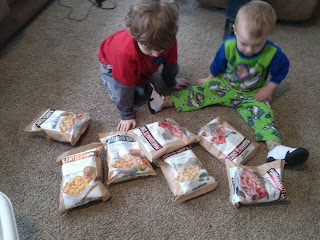 Simply 7 sent us a whole case of their chips including at least one of each flavor. 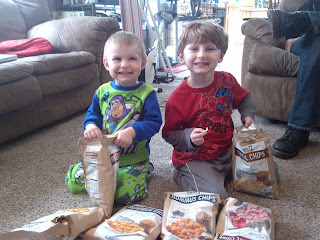 As you can see from my pictures the boys were pretty excited to open these up the minute they arrived. I would have never picked these up in a million years for anyone in this house except maybe myself. So I was pretty happy to see my entire family eating away at something healthy. I will be getting more in the future that's for sure! Recommendation: Not only did I love knowing what I was eating and feeding to my family but I loved the fact that they have a recipe for the perfect dip for each flavor of chip on their website. I would definitely recommend these! 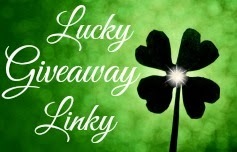 Giveaway: Simply 7 is going to give one of A Lucky Ladybug's lucky readers a case of chips of their own! I would enjoy trying Pomegrante Chip Black Pepper flavor. 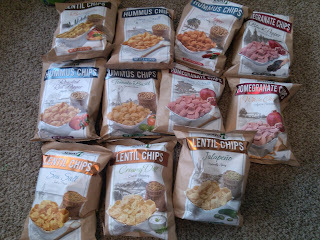 I'd like to try the Jalapeno Lentil Chips. I love the giveaways but the one thing I have found frustrating about entering them is the Pinterest request tab asks you to pin a picture from the giveaway but the pin button doesn't seem to lead anywhere. I have tried every way in the world to figure out how to accomplish this one. 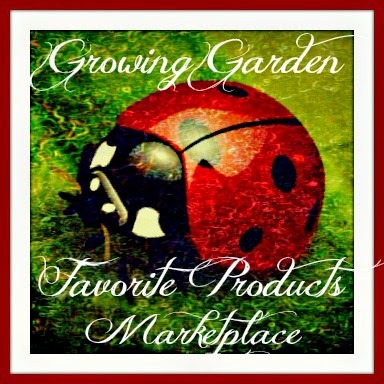 My only recommendation would be to make it easier to pin your giveaways or remove that request from the follow entry. Not sure if anyone else has had a problem with this one or if it's just me but that's the only thing I can think of. I enjoy your blog just the way it is. 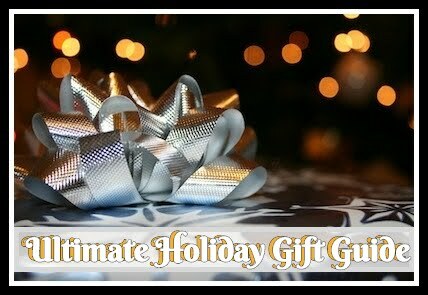 It is a lot of fun reading reviews and entering the terrific giveaways! I'd like the creamy dill. Creamy Dill or White Cheddar, please! The Sea Salt hummus chips look good to try. The lentil jalapeno sound delicious! I love these things. 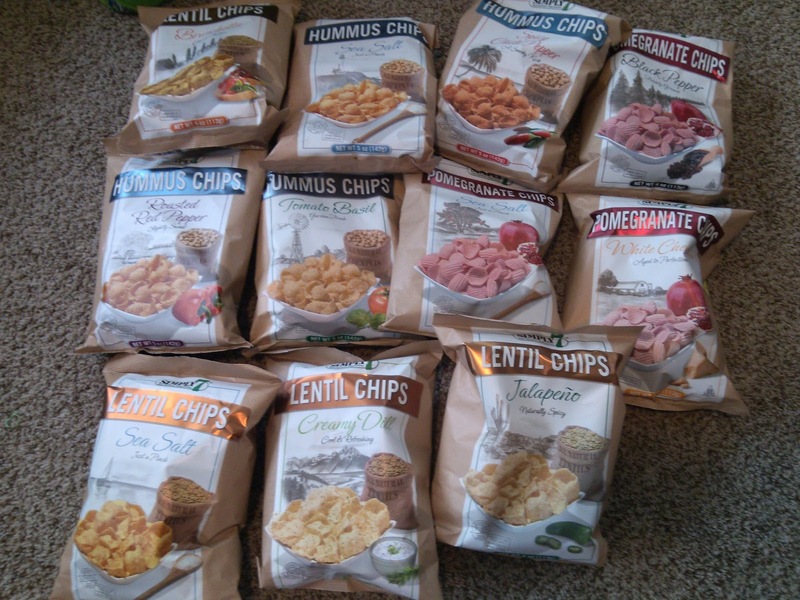 I'm curious about the pomegranate chips and I'd like to try the hummus with roasted red pepper.